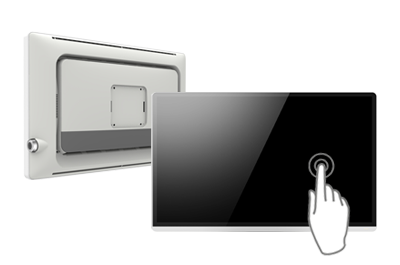 The new 2018 HMI industrial control touch display series features a minimalist style; the front frame is IPX5-rated waterproof and dustproof and covered entirely with glass to create a TrueFlat touch surface that supports 10 point touch. Regarding body structure, the configuration of the electronic components is optimized to make the appearance of the product thin while retaining good cooling performance. At the same time, integrated speaker holes, screw holes, and heat dissipation holes contribute to airtightness and integrity. The durable metal base and intuitive knob are used to extend the durability and operational ease of the product. The easy-to-remove cord storage cover and the outlet design for keeping cords organized helps users organize cables easily and neatly. 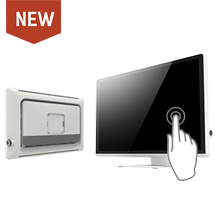 Comes with a VESA 100 x 100 wall mount standard while offering an optional 200 x 100 adapter plate users can purchase, this new product is practical yet concealed, beautiful, and waterproof.